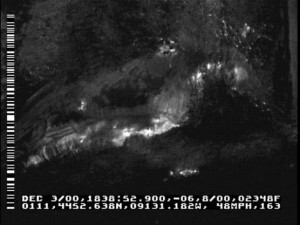 The U.S. Forest Service uses aerial infrared imaging to monitor forest fires. This information can be sent immediately to those in charge of controlling fire lines. 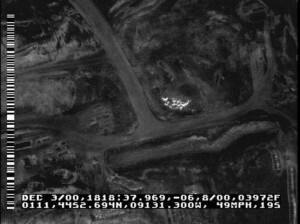 Subsurface fires can also be monitored using aerial infrared thermography. Landfill fires can be hazardous to the surrounding environment. Knowing where, how many and the extent of underground fires is useful to those in charge of containing and/or extinguishing them. More and more fire departments are purchasing IR imagers for ground-based fighting of structural fires. 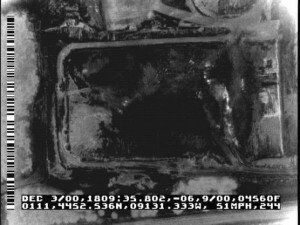 Aerial infrared can be especially helpful on large, single story buildings that are on fire. With subsurface and structural fires, “where there’s smoke, there’s fire” does not necessarily hold true since smoke may come out in one place, but the hottest part of the fire is in another. Peat, coal and wood chip piles can combust spontaneously. A landfill fire occurs when waste disposed of in a landfill ignites and spreads. In landfills that do not cover their waste with daily cover, biological decomposition creates substantial heat and can cause material in the landfills to spontaneously combust. Landfill fires are especially dangerous as they can emit dangerous fumes from the combustion of the wide range of materials contained within the landfill. 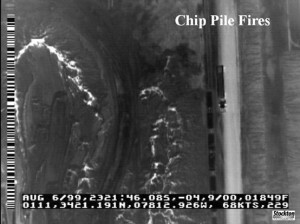 Subsurface landfill fires also, unlike a typical fire, can not be put out with water. They are similar to coal seam fires and peat fires. Oxygen intrution control is the best method to prevent and fight subsurface landfill fires. “Fuel quenching”, by allowing landfill gas build-up, can work well, especially in conjunction with maintenance of the daily cover of soil or material places on landfills. Nearby streams can be threatened by leachate pools which may form if water is used to extinguish fires in landfills. There is also the danger that the landfill’s membrane, a barrier placed under most modern landfills to prevent contamination of the underlying ground, will be destroyed or penetrated by the fire itself. Normally this liner prevents harmful liquids contained within the landfill from escaping into the groundwater and nearby streams. Destruction of the liner therefore leads to serious environmental problems, sometimes worse. Conventional methods (deer-car collisions, spotlighting, pellet counts, deer tracks) are considered to be accurate within 30 to 40 percent – not a high number. In this method, we are looking at 100% of the area in question and under good conditions all active deer not hidden from view should be seen and counted with infrared. A Division of Stockton Infrared Thermographic Services, Inc.
© 2016 Copyright AITScan & Stockton Infrared Inc.
Are Electrical Switchgear Surveys still the “Low-Hanging Fruit” of Infrared Thermography? “Your Facility is Leaking”-Get the Picture! Linking thermal mapping results to CAD and GIS systems.